Return vents play a critical role in a properly functioning heating and air conditioning system. Here are three mistakes you might be making with yours. When your HVAC system is on, you feel the warm or cool air blowing out of your air registers. But do you know where that air comes from? It has to come from somewhere and in most homes, it’s from another part of your home. Where the air enters the HVAC system is an opening called the return vent. If something is blocking the return vent, the HVAC system literally cannot breathe. This results in less warm or cool air coming out of your air register. This also means your HVAC unit works much harder. Therefore, it becomes less efficient and may use a lot more electricity to try and compensate for the blockage. 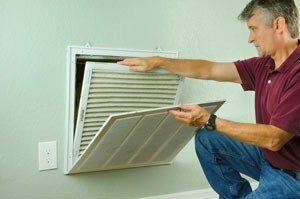 The return vents begin to gasp for air when a homeowner doesn’t clean them on a regular basis. With dust and dirt in the vent, less air can flow through. This is because most return vents in homes also contain an air filter. And a dirty return vent almost always means a dirty air filter. Even with a clear return vent with nothing blocking it, another mistake some homeowners make is not having enough vents to supply the air the HVAC system needs. If the air handler in the system cannot get enough air, it will not work as efficiently, resulting in higher energy bills. To make the most of the heating and air conditioning system in your home, avoid making a mistake concerning your return vent. If you would like additional guidance on return vents, one of the HVAC experts at Wilson Refrigeration and A/C Service will be more than happy to help. Connect with us online to get in touch with our team today.